The lung has numerous roles, including gas exchange, immune surveillance, and barrier function. Being a highly vascularized organ, the lung receives dual blood supply from both the pulmonary and bronchial circulation. 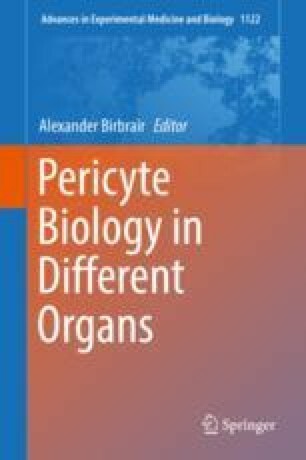 Therefore, pericytes likely play a prominent role in lung physiology given their localization in the perivascular niche. New genetic approaches have increased our understanding of the origin and the diverse functions of lung pericytes. Lung pericytes are myofibroblast progenitors, contributing to development of fibrosis in mouse models. Lung pericytes are also capable of responding to danger signals and amplify the inflammatory response through elaboration of cytokines and adhesion molecules. In this chapter, we describe the molecular, anatomical, and phenotypical characterization of lung pericytes. We further highlight their potential roles in the pathogenesis of lung diseases including pulmonary fibrosis, asthma, and pulmonary hypertension. Finally, current gaps in knowledge and areas of ongoing investigation in lung pericyte biology are also discussed. The authors thank all the members of the Schnapp and Hung laboratories who have contributed to studies described in this chapter. We also thank Seth Bollenbecker for providing the artwork in Fig. 3.3.